Nectar-feeding bats are great pollinators, but locating flowers at night can be difficult. While not having the high pitched, highly tuned sonar of insectivorous bats, nectar feeding bats get some help from plants that have parabolic reflectors that bounce their acoustic signals right back at them as they approach flowers. 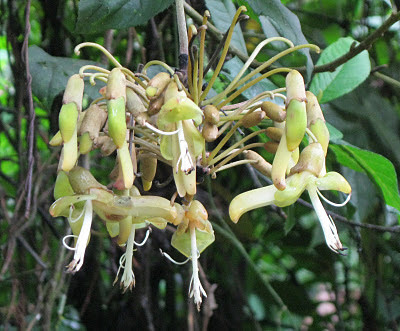 While several flowers, like the standard petals of these neotropical legumes (Mucuna), have acoustic reflectors, new research has found a plant that grows leaves with a parabolic shape right above their inflorescences to guide bats to their flowers.